Our theme image for Sepia Saturday 197 does not come from one of the on-line collections on Flickr Commons. Let's face it, no world-class image collection would give album space to this blurred, scratched, undefined, and plain boring image. In fact it comes from the collection of that great photographer, Frank Fieldhouse (AKA "Uncle Frank"), and is entitled "The Pennines (From Express), 1941". 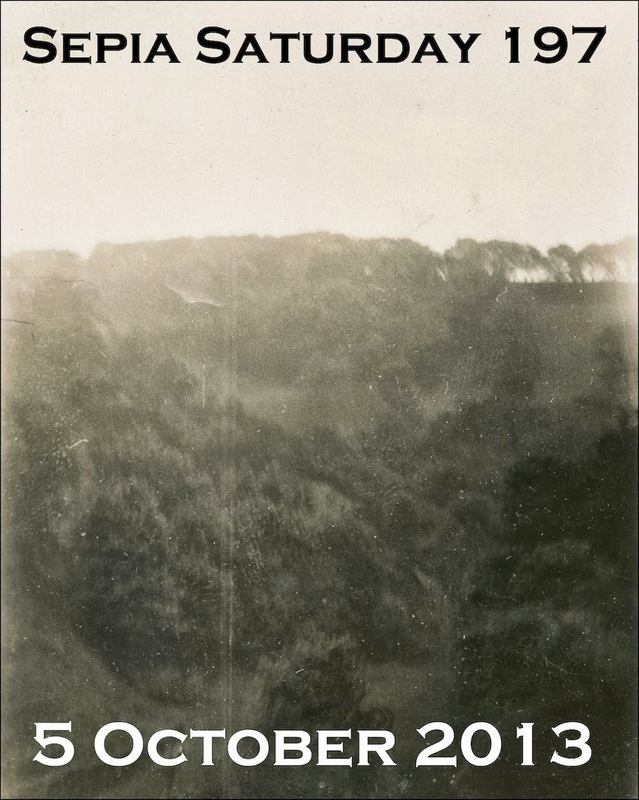 Dusty, dirty, and plain as it is, it reminds us that we all have such images in our collections - and sometimes they can be as revealing as a picture postcard. So for Sepia Saturday 197 we are inviting you to by-pass the best, avoid the crystal clear, and focus your attention on the less than perfect, because, as we all know, all too often, life is less than perfect. Everything else about Sepia Saturday remains the same : just post your post on or around Saturday 5 October and link your post to the Linky List below. 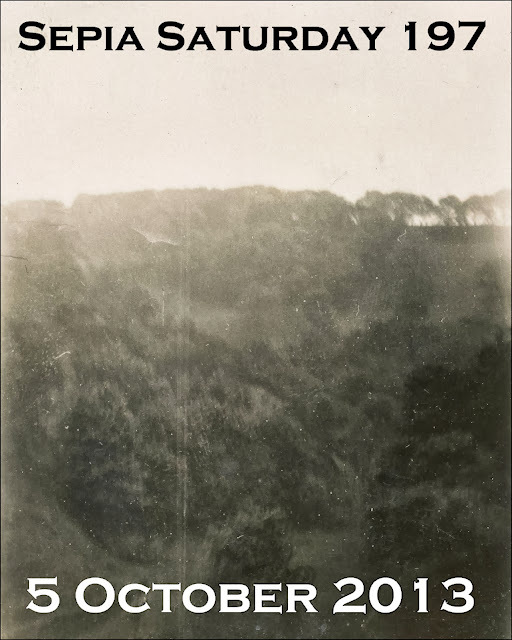 I know what you are all going to say - "we don't have any bad photos in our collections", but, fear not, our focus on the unfocused is for one week only. After that, we revert to the normal Sepia Saturday approach - and here are the next two calls so you can do a little planning in advance. 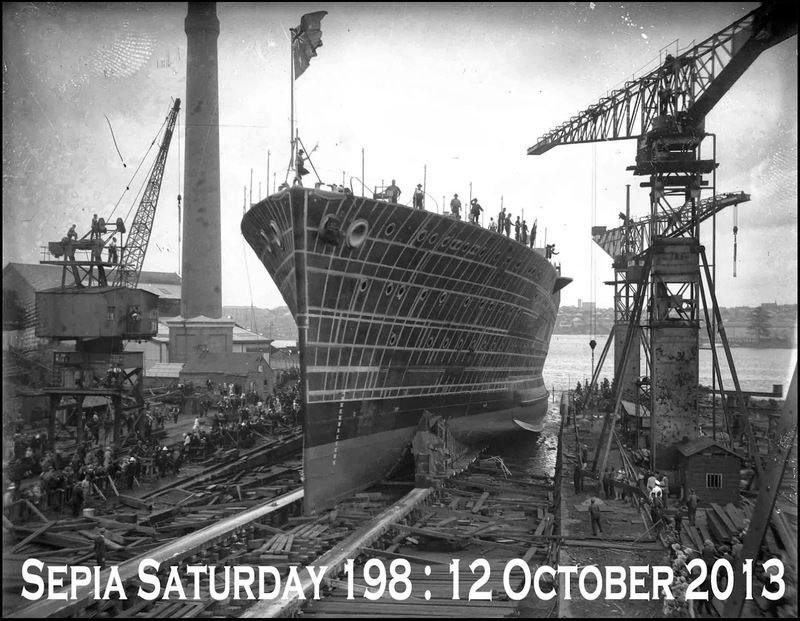 198 : It is 100 years since HMS Queen Elizabeth was launched at Portsmouth. Whilst this is not the Queen Elizabeth, it matters not, because in SS 198 we celebrate the start of something new. It might be a life, it might be a love, it might be a a new chicken coop or it might be a mighty ocean liner. 199 : For Sepia Saturday 199 we celebrate acting and theatre. 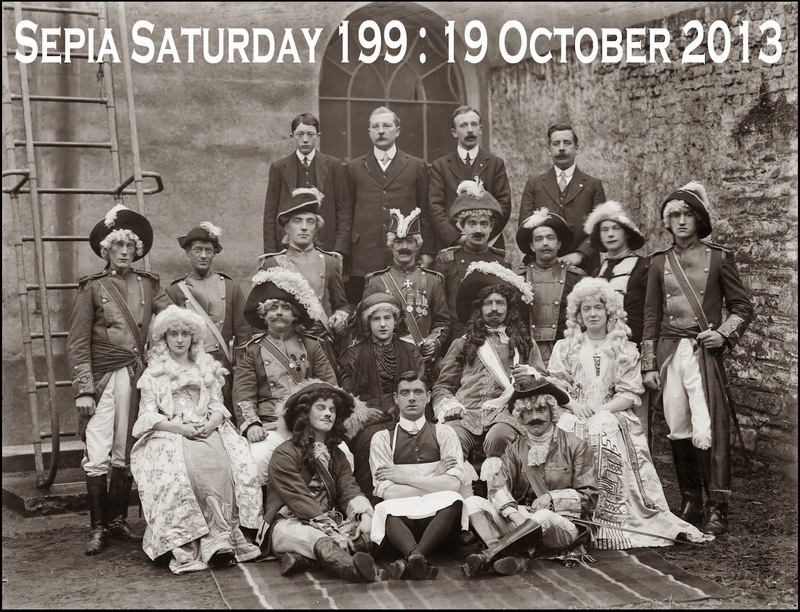 And dressing up, and silly hats, and daft trousers, and fire escapes, and - anything else you fancy. Before you dash off in search of the plain and ordinary, the mathematicians amongst you will you realised from the number sequence above that we are rapidly approaching our very special double century celebrations. 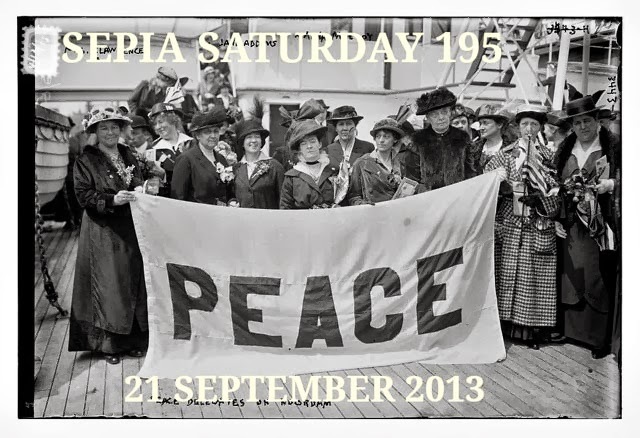 We have something very special planned for Sepia Saturday 200 which I will tell you about as soon as Marilyn reminds me what it is. This week's prompt comes from the George Eastman House Collection on Flickr.com. in the set of Nickolas Muray. Regular Sepians who click on the link of his name will immediately recognise images of his that have been featured before. Yes I know they're anything but sepia and for that alone they are remarkable. Muray was a pioneering commercial photographer, responsible for establishing many of the conventions of colour advertising. This example is for an insurance advert and those Sepians who like to theme may choose from any number of prompts here. The photo appears to have been taken by the doctor, who has left his coat draped on the bedposts and his bag on the bed itself, thus ensuring that any bacteria is neatly carried on to his next patient. In addition we have a boy in bed, toys and patchwork quilt. 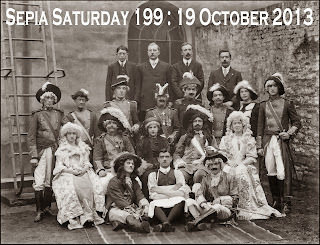 If the prompt throws up (sorry) any other themes we look forward to reading them on your blog, which should be posted on or about 28 September. I've put a mini-banner at the foot of this post and it's virus-free - as far as I know and an injection of humour should cure it anyway. Next, please link to your actual post (by clicking on its title within the post and clicking on the URL which this generates) to Mr Linky and then leave a comment below. Try to visit as many other contributors as you can and please make an effort to leave a comment, however small, as a sign of appreciation of their contribution. Don't forget that there is a Sepia Saturday Facebook group too where bloggers often post extras and afterthoughts. We help one another out with technical issues and generally have fun. 197 : We have all taken photos that are, shall we say, less than perfect. We celebrate these in SS 197 : the pointless photos, the blurred photos, the photos that would have been better left unprinted. But sometimes they tell a powerful story all on their own. This Saturday co-incides with the International Day of Peace and more specifically to Peace Education; this is too good an opportunity to miss. It is often said that we learn so much from Sepia Saturday, both as participants and visitors to each other's blogs, so now is our chance to embrace the theme and do our bit for this important day observed throughout the world. The splendid photo above comes from the archive of the Library of Congress and features the American delegates to the International Congress of Women, held in the Hague in 1915. 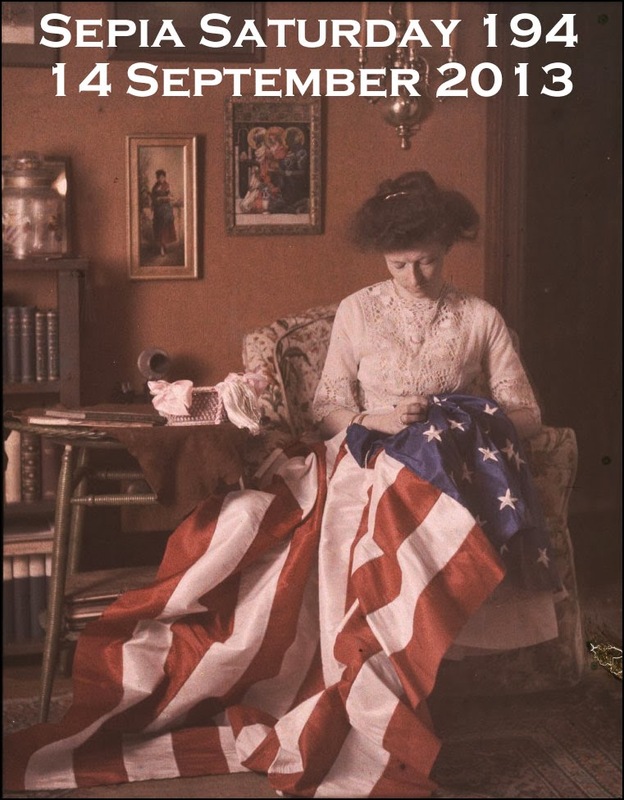 One of the delegates, Jane Addams, was the first American woman to be awarded the Nobel Peace Prize. Activities around the world this year will include; ceremonies, prayers, choirs, tree-planting, art exhibitions, lighting candles and peace walks. Your response could be one of these from the past, historical or personal, or you may like to go with the Nobel Peace Prize or Peace Education. As the box on the top right of this page reminds us, it can be fact, fiction, poetry or prose. I'm very much looking forward to your contributions. When you've posted your blog, somewhere around September 21, don't forget to add the link to your actual post (by clicking on its title within the post and then copying the URL which this generates) to Mr Linky, and then leave a comment below. Please link back to this Sepia Saturday page, and there is a mini-banner to add too if you choose. Try to by visit as many other contributors as you can and please make an effort to leave a comment, however small, as a sign of appreciation; we Sepians thrive on comments, and being a friendly group we will try to return the favour. Don't forget that there is a Sepia Saturday Facebook group too where we often post extras and afterthoughts. We help one another out with technical issues and generally have fun. Now, before you go off on your peace march take a quick look at the upcoming posts, so that you can keep them in mind whilst sorting through the albums. Enjoy your week. 196. This 1935 Insurance ad has plenty of possibilities to theme; the large bed, small boy, quilt, doctor's bag, toys. Take your pick. This wonderful image flags up all sorts of possibilities if you like to try and match one of its themes. For me, anyone sitting absorbed in the craft of needlework in a domestic setting conjures up a picture of contentment in executing a piece of work which will be used, admired and talked about. There are, of course, other settings where the person, often a child, wielding the needle, is not so content, but I'm sure you don't need me to spell those out for you. For the present let's enjoy this particular autochrome plate from around 1910 and pore over the rich details: the folds of the flag; the woman's lace blouse; the chintzy chair; the sidetable with sewing basket; the bookcase; the chandelier; the picture of three saints. So many choices for you to consider when selecting your own image to feature in this week's Sepia Saturday. When you've crafted your blog, somewhere around September 14, don't forget to add the link to your actual post (by clicking on its title within the post and then copying the URL which this generates) to Mr Linky, and then leave a comment below. Please link back to this Sepia Saturday page, and there is a mini-banner to add too if you choose. Make sure there are no loose threads by visiting as many other contributors as you can. Please make an effort to leave a comment, however small, as a sign of appreciation; we Sepians thrive on comments, and being a friendly group we will try to return the favour. Now, before you open your workbasket take a quick look at the upcoming posts, so that you can keep them in mind whilst sorting through the albums. Enjoy your week. 195. Today will be International Day of Peace. Sepians can do their bit by highlighting it in their blogs. Activities around the world will include; ceremonies, prayers, choirs, tree planting, art exhibitions, lighting candles, peace walks. Your response could be one of these from the past, historical or personal. 196. This 1935 Insurance ad has plenty of possibilities to theme; the large bed , small boy, quilt, doctor's bag, toys. Take your pick. Some times you just need to be alone. You need space : space to think, space to breathe, space to contemplate your place in the great scheme of things. What better way to find such space than to get into a boat and row out into the middle of the sea. This is what this young lady did back in 1900 somewhere near Estonia. 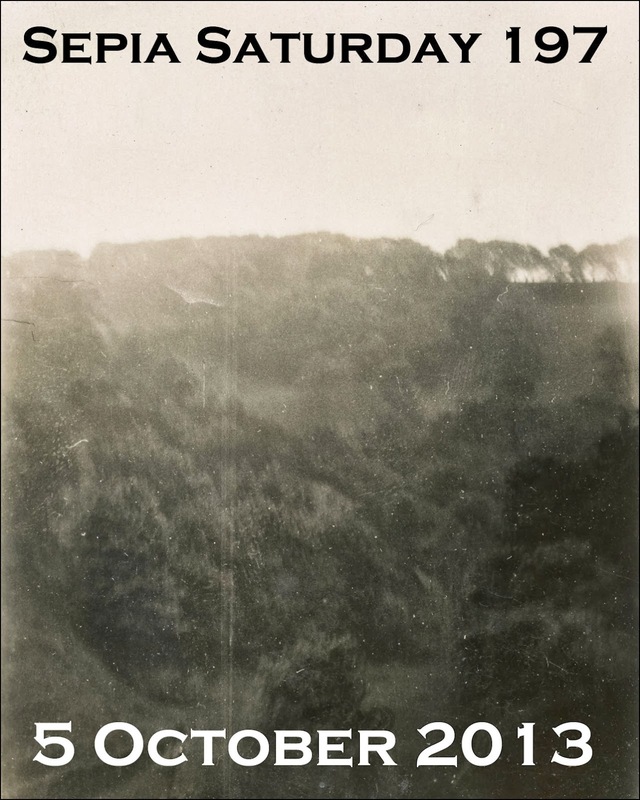 And her trip into the middle of nowhere was recorded and is preserved for ever in the Flickr Commons stream of the National Archives of Estonia. 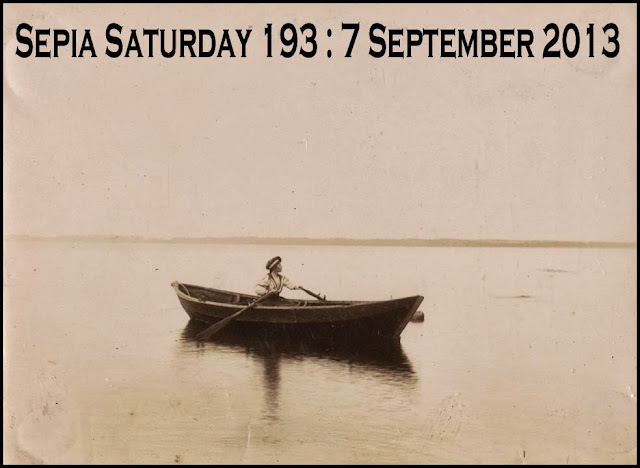 For Sepia Saturday posters who like a theme, there is any combination of girl, boat, middle and nowhere. Whatever you decide to go with, just post your post on or around Saturday 14th September 2013 and link it to the list below. But before you go in search of solitude, perhaps you would like something to think about whilst you are floating on the waves. 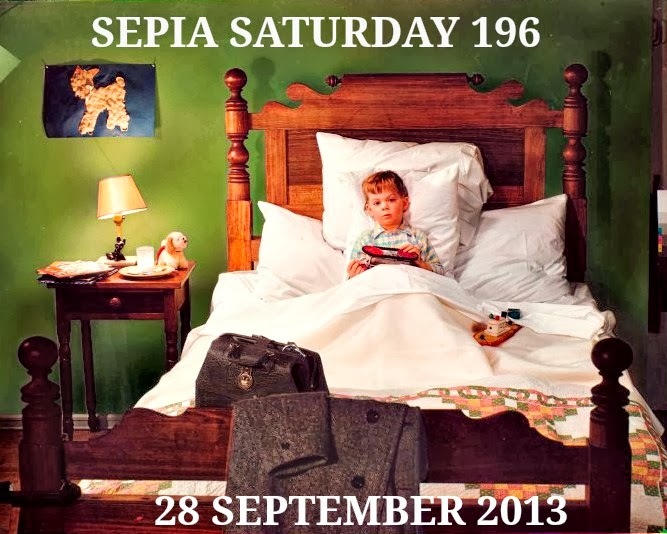 Here are the next two Sepia Saturday theme images. 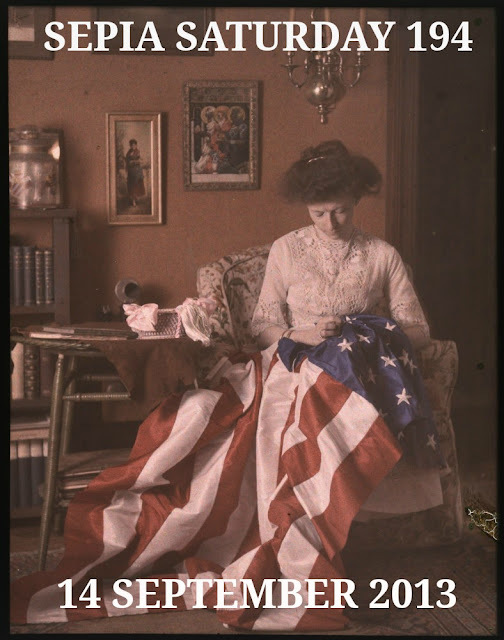 194 : Here is a woman making an American flag which might point you in the direction of flags, sewing, books or even chandeliers. So now you know what is required of you, not just for this week but for the two weeks after as well. Free yourself of all distractions, find your own piece of solitude, compose your posts, post your posts, and then row around and visit all your sepia friends.